RoadDriver is an easy-to-use online driving community, their objective is to influence driver behaviour by reinforcing the driver's responsibility to drive within set speed limits and in an appropriate manner and at the same time provide the means to compliment and recognise good driving behaviour. If you had an emergency or a loved one was in peril you would want the emergency services to reach them as quickly as possible. In an emergency situation minutes can seem like an eternity to those waiting for help. Everyday police, fire and ambulance vehicles respond to urgent calls. Precious time lost getting there could mean the difference between life-and-death. 1. Emergency drivers are especially trained to drive in emergency situations. When you hear emergency vehicle sirens, don't panic, stay alert, and avoid being distracted. Keep the noise level down in your vehicle, continue to look and listen and be prepared for more than one emergency vehicle. 2. Sometimes it can be difficult to work out where the siren noise is coming from. If you can't see the emergency vehicle, other driver's reactions such as slowing down or pulling over, may give you a clue to which direction the emergency vehicle is coming. 3. When you do see the emergency vehicle's flashing lights in your rear view mirror. Scan the road front and sideways and try to anticipate the likely route the driver of the emergency vehicle will take. If you're on a long road with no turnings ahead, it's sensible to assume that the emergency driver wishes to drive straight on and get past you. 4. You should not slam on your brakes or stop abruptly blocking the road or a junction. Look ahead for a safe area where you can pull over. You should use your vehicles indicators or hand signals to let other drivers and the emergency vehicle driver know your intent to pull over. 5. Wait for the emergency vehicle to pass and watch for more than one emergency vehicle. Check to make sure the way is clear and signal before merging back into traffic. 6. Never follow or try to outrun an emergency vehicle which is responding to an emergency call. If you do, you most likely will be breaking the speed limit and could also face charges of careless or dangerous driving. 7. 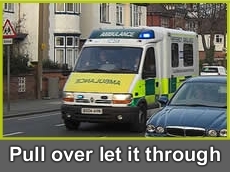 Never try to overtake a moving emergency vehicle displaying flashing lights unless directed to do so by a police officer or emergency personnel.